At the end of every year I like to look back at where my photography has gone, and get clues as to where it might be going. This has been a particularly interesting year actually. During the summer last year, I changed a lot of things with how I was doing my photography. My outlooks changed, and my product changed. I actually had a pretty decent sized renaissance in 2016 which has helped to shape 2017. I was fortunate that the growth that I experienced has flowed throughout this year. 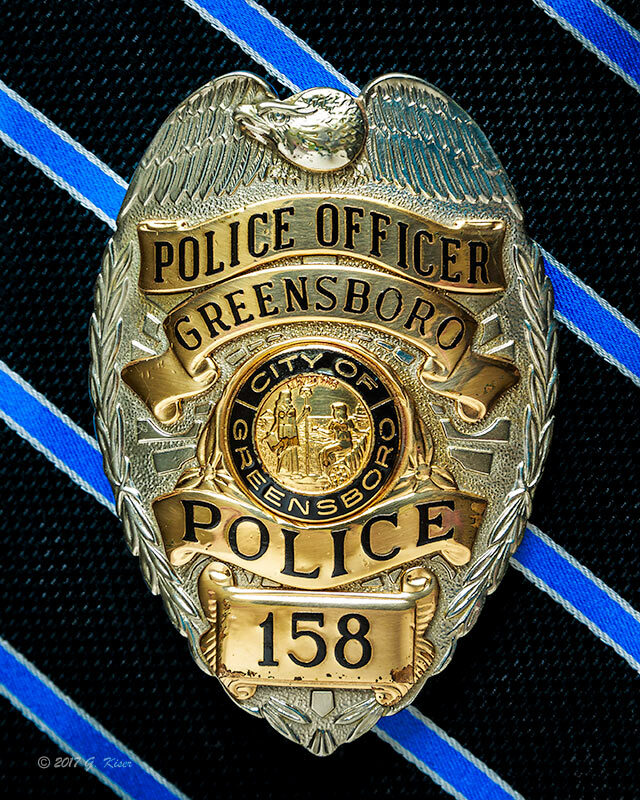 When it comes to big news, I would have to start out by detailing my "Badge on Thin Blue Line" series. Even though it didn't even exist until June, it has been my most popular product for the majority of the year. It all started when one of my clients asked me to do something special with an officer's badge that was leaving our department. I was very hesitant to take on the job since it had been years since I had worked in a studio environment. He convinced me to give it a try though, and I took the badge. I spent days pouring over how to photograph the badge in a special way that wasn't just your typical capture. 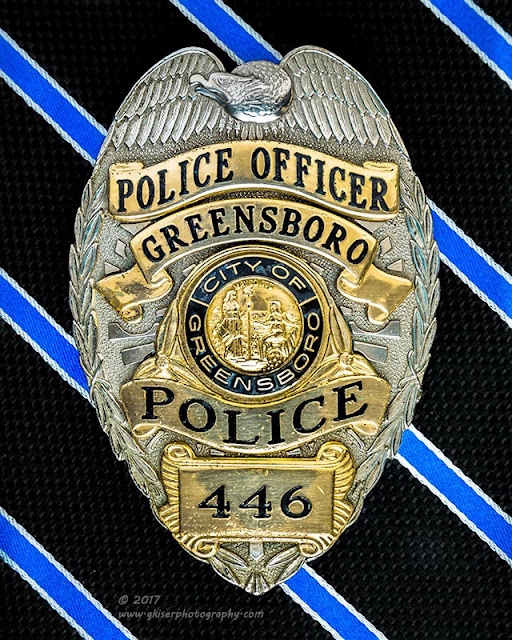 In the end, I decided on using a clearance rack tie as a background and shot the badge to show every scar that is the story of the officer's career. When I made the print and framed it, I knew I had something really unique and was excited to show it off to the client. Of course, the delivery went well, and both my client and the receiving officer really liked how it turned out. Since that time, I have had numerous orders for these one off photographs. Even the Chief of Police with my department is among that list of clients. I have extended my catalog to include two different badges from New York, as well as Crime Scene Investigator, and Telecommunicator badges from my department. I am so excited that this project has taken off so well since June. While the badge pictures are a wonderful source of getting a little pocket money, my main focus is still landscape photography. My style is ever evolving when it comes to how I capture what I see. This year has really been one of those years where I have learned to really focus on particular elements of the scene and fill the frame with what is important to me. For the first time, I have started to isolate specific elements of the landscape in earnest, and that has really paid off in the long run. 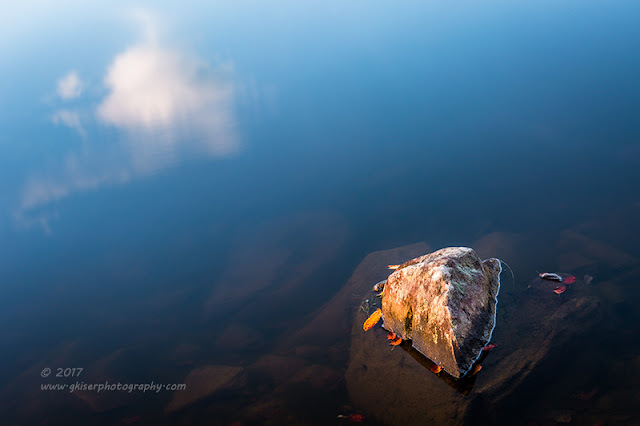 I refer to this type of landscape photography as isolations, or intimate captures. As you can see from the above pictures, this technique works equally as well on many different subjects. It adds a certain abstract quality to the world that is around us. By really focusing on specific elements of a scene, I have become more closely connected with the landscape around me. I have always listened to nature and cared how it wanted to be photographed, but there were times that I got confused with how I read a scene. If there was a tree that caught my attention, I would try and fit that tree into an entire scene. That wasn't always what was being asked of me as a photographer though. There were times when the tree was the picture, all by itself. Now I'm much better at isolating just that one element in a photograph and doing justice to that particular subject. I have found that this photographic technique is so effective, I have created a spinoff gallery room for "Woodland" photographs. There is a completely different feeling to the photographs when you isolate just a portion of the landscape. This has allowed me to enjoy more time behind the camera while on hikes through the forest. I'm always spotting different scenes that stick out, and now I am better aware of how to photograph them. I've become much better at listening to the world around me. 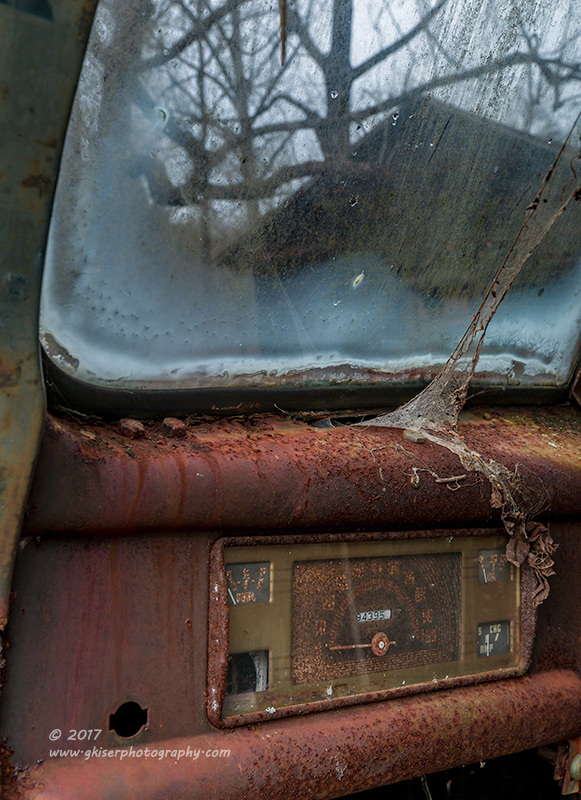 Speaking of isolations, I have even brought that into my automotive photography as well. 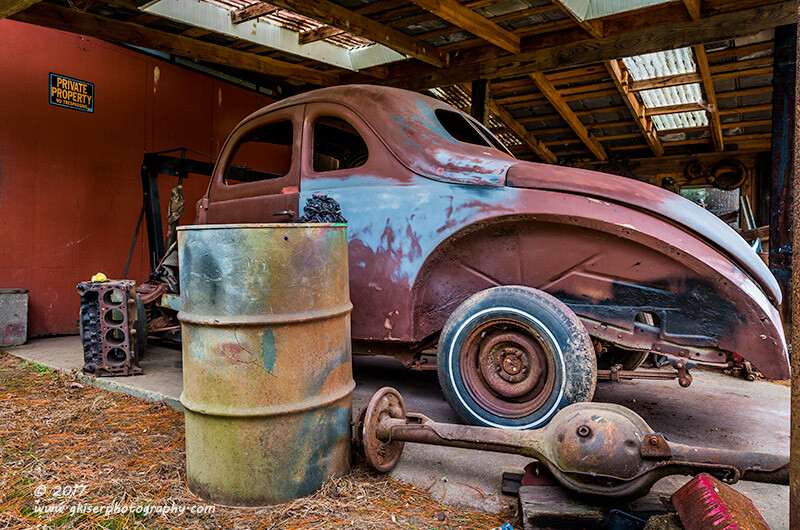 I have been very limited in the past trying to photograph old vehicles because I wanted to capture so much of them. By seeking out details inside of the big picture, I am now able to really work a scene with an old car. 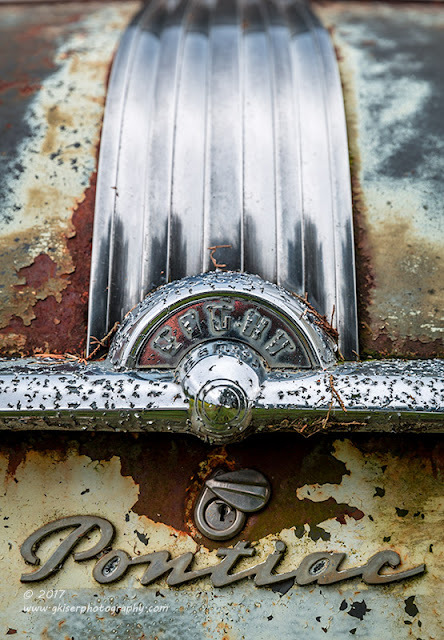 I've found that I am particularly interested in the emblems and other "bling" on the rusty surfaces. I am able to pick out just those elements that I like and present them as an "autoabstract" picture. This has opened up the field for my "Old Iron" photography because there are a lot of really great cars out there that aren't exactly placed in a photogenic location. I now have a great option to capture them which only requires lighting to be addressed. The background becomes irrelevant since the body panel and patina becomes the background. Shooting intimate photographs isn't the only change that my style has seen this year. 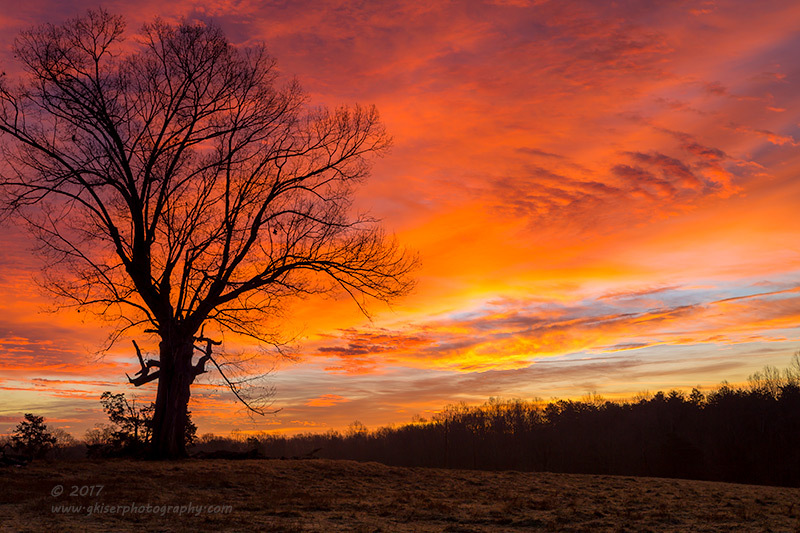 I have also started to shoot multiple image panoramas that are stitched together in post processing. This has opened up a huge (pardon the pun) new avenue for me when it comes to compositions. Unlike with isolations, I am not trying to pick out the one single most important thing. These are the times that I want to capture the entire scene to convey what I am really seeing on a grand scale. To do that in a single shot requires a lot of extra elements, or negative space to be included. If you crop those out of a single shot, you are left with a limited number of pixels which greatly reduces your ability to print the image at any respectable size. 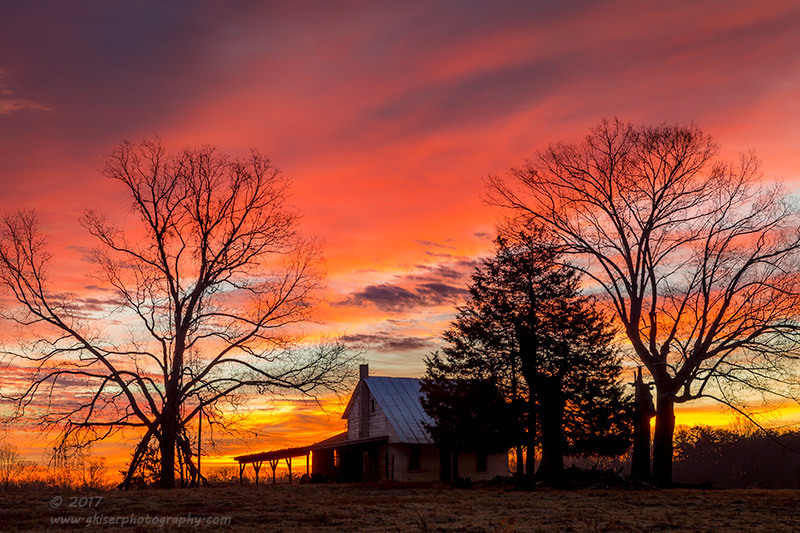 What a panorama does is allows you to stay close to the line of interest in your composition and include a lot of elements along that plane while eliminating the negative space or clutter. Once stitched together (can be up to 8 or more images), the final rendering has enough pixels to be printed out big enough for nearly any purpose...certainly big enough to fill up a wall in a home. There have been several times as in the picture above that I have seen a scene unfolding in front of me, but couldn't pick out a composition that conveyed what I was seeing because of too much clutter at the top and bottom. 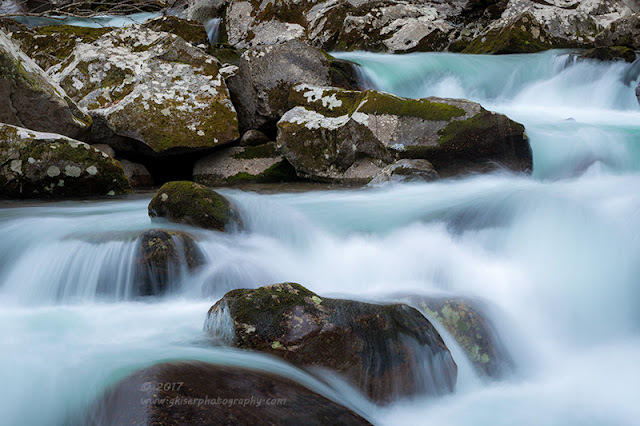 By shooting a large swath of the landscape, I can focus on many of the larger elements, such as the way the light was affecting the mountain, or maybe a very wide cascade feature. The extra, negative space above and below is eliminated forcing the attention right where I want it. High Dynamic Range has also been added to my toolbox this year. 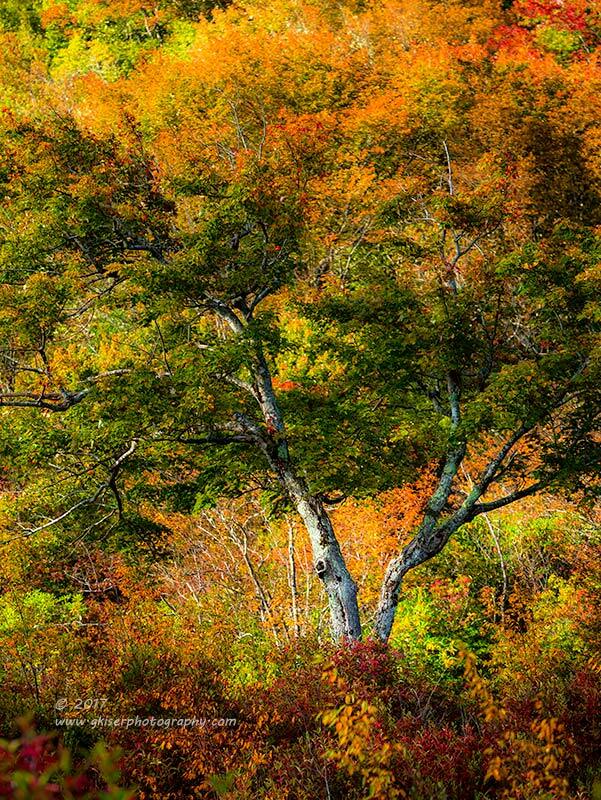 Like panoramas, this technique requires stitching images together. However, it is not stitching a string of them together to create a larger print as with the panoramas. It is designed to "stack" identical images on top of each other which were exposed with different shutter speeds. This gives several layers of overexposed and underexposed images in addition to one that is "properly" exposed. The benefit we see here is you can get an insane amount of detail in the shadows and highlights of a picture. I will typically shoot a series of four to seven images to stack together to make a final print. In the case of the waterfall above, I have never before been able to capture this scene with a blue sky in it. In order to keep any detail in the rocky wall, I had to blow the sky out. If I wanted to keep detail in the sky, everything but the white water would be in murky shadows. By going through an HDR conversion, I was able to get all of the tonalities represented here properly as my eyes actually saw it at the time. The Ford above was just about as difficult to shoot. It was a bright day, and the car was in the shadows. For the color pallet, I wanted to make sure that I had an interesting blue sky to include. Unfortunately, that meant that the car would be in the deep shadows sitting under the tree. A cloudy day would produce similar results as well. 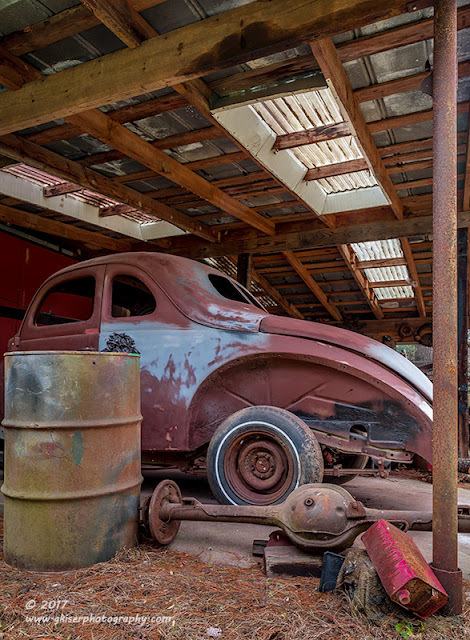 In order to get the car properly exposed as well as the detail inside of the garage, while keeping the sky under control, HDR was the only way to go. I believe that this was seven shots all put together and then massaged in Lightroom. The final image has detail under the hood, in the garage, and even in the white clouds above. I credit this technique with winning an award with this picture in the Fall of the year. Had I not been able to get the details right, the picture wouldn't have looked nearly as good. 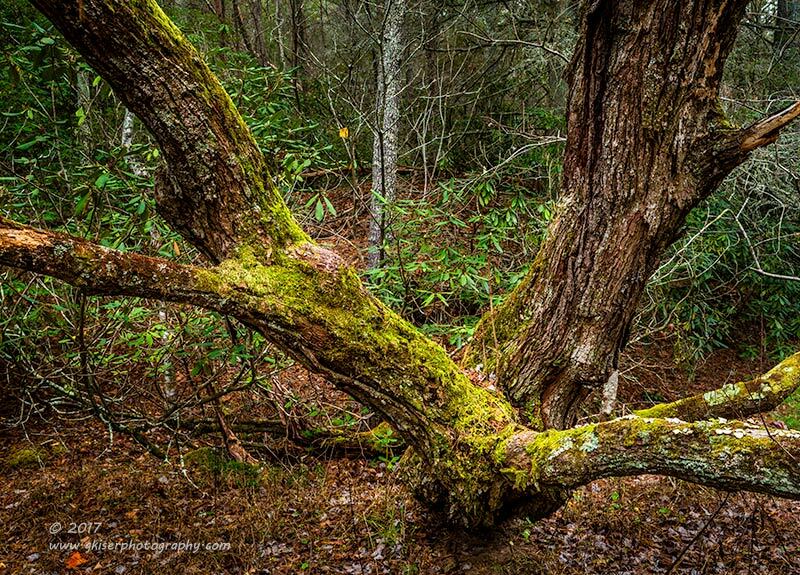 Speaking of contests, I have continued to participate in various types of competitions with other photographers. Of course, I am wanting to win, but I have been doing these contests in order to learn more about my own photography. It has been a great tool to aid in my self critiquing. 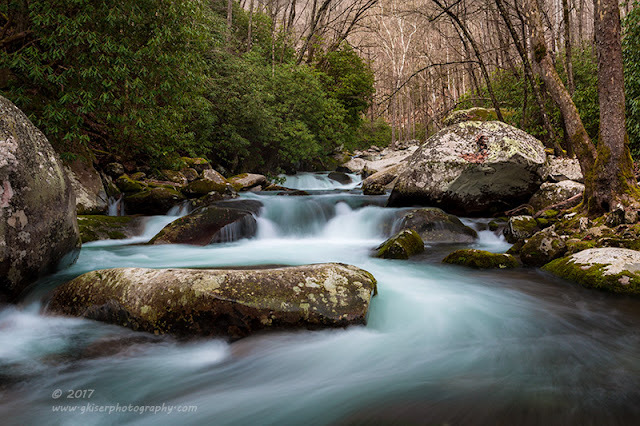 Early on in the year, I entered the American Landscape Competition as hosted by Outdoor Photography Magazine. This was pretty scary for me since I've not done any online competitions before, let alone one hosted by a national publication. I was able to select up to six images to go up against photographers from all over the world. It was lofty, but I enjoy the magazine, and I wanted to see what would happen. I selected a total of six images and submitted them. I don't know how many were submitted overall, but I was not listed as one of the finalists. Looking at the winners as they were published, I had no problems at all with the judging. The winners were all spectacular and well deserving of the top slots. It was, after all, a learning experience for me. I learned about the formatting for submissions, and some of the considerations to look for in making my own selections. It has nothing at all to do with your own favorite images, it has to do with what fits the theme of the contest, or the feel of the hosting publication. 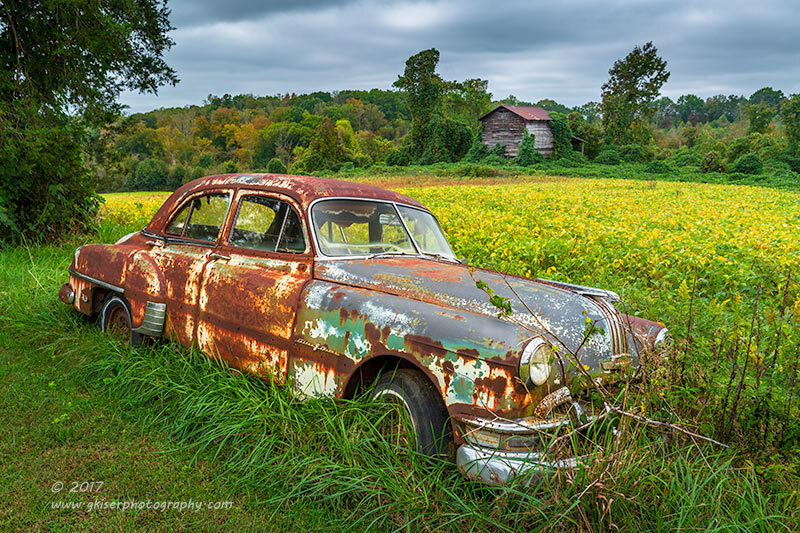 It was mid Summer when I got the news that my images hadn't made the cut for the American Landscape Competition. So when it came time to select my entries for the Dixie Classic Fair, I was really starting to second guess myself. I wanted to enter one of the images that I had submitted to the magazine because I still thought that they were very good images. I had to remember the lessons that I have learned though, and one of them was to submit images based on the theme and feel of the venue. 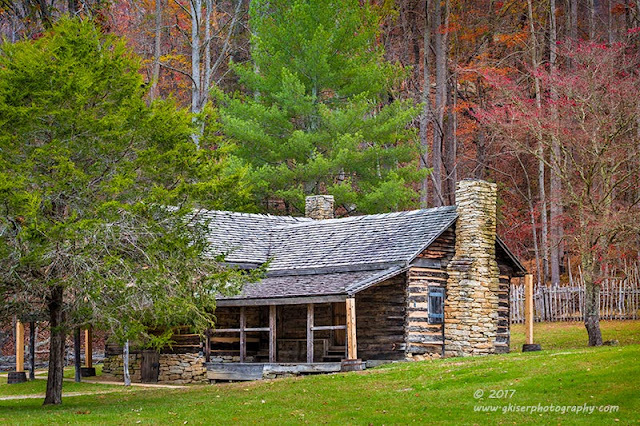 I knew that my rustic images worked well from the previous year, and figured that I would stand the best chance by submitting a couple of those again. 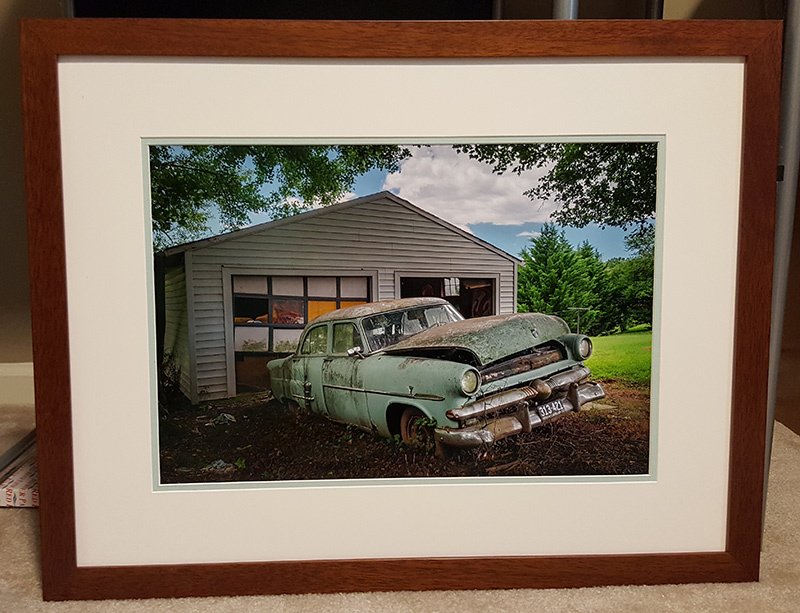 After a lot of debating, I decided on these two images which I had framed at my favorite frame shop, After 5 in Greensboro. Both turned out wonderful, but I was thinking that my Black and White entry was the stronger of the two. Both were entered in the respective professional categories and I waited until the judging to find out how I did. I was elated to discover that both of my photographs had been recognized with ribbons. My color entry won a first place ribbon, and in an odd twist, the black and white entry brought home a second place ribbon. I found the first place winner in that category, and while it wasn't a picture I particularly liked, I could see why it won in the category. Again, I turned this into a learning experience and realized what I could do differently in my selection for next year's contest. They were obviously looking for more contrast in the scene with very pure whites and blacks over more of the image. 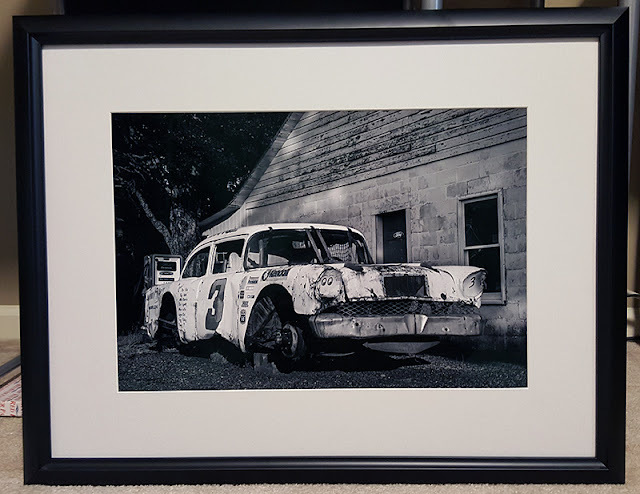 I can't complain at all with the second place recognition since a couple of months later, I sold this framed print to a new client who had seen it at the fair. I decided to continue entering contests to expand my experience a little bit more. The next one that I entered was at the beginning of Fall with my CNPA (Carolina's Nature Photography Association) group. 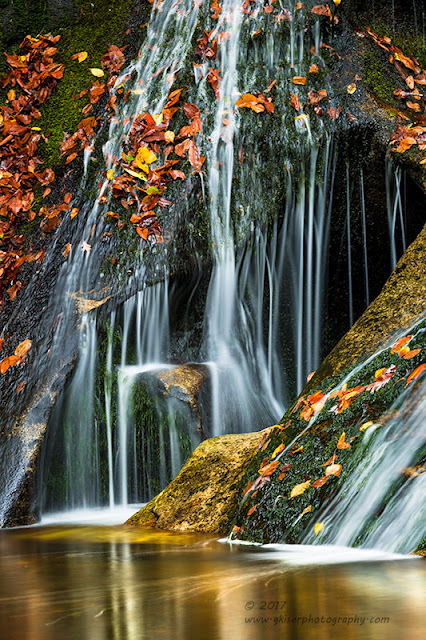 This was the annual members choice contest and the winners were selected by other photographers within the group. I was able to enter six images across multiple categories. 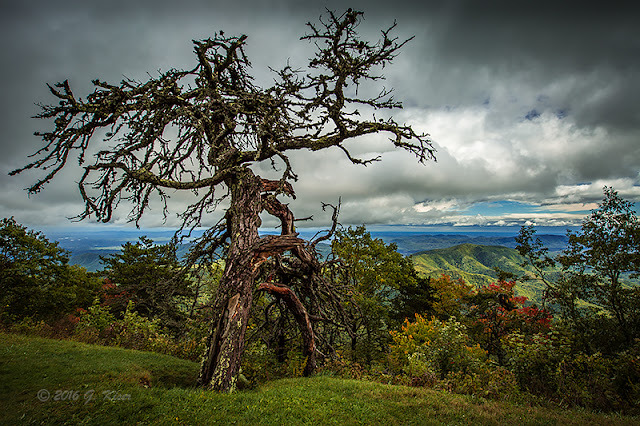 I ended up entering five in the Tier 1 Landscape category and one additional one in the Tier 1 Trees category. I opted for the Tier 1 category which is more or less reserved for winners of Tier 2 and those that are routinely selling their images. Based on the rules, I could have entered in either tier, but wanted the challenge of going in all the way. The voting concluded on December 1st, but the winners and runner ups will not announced until the annual meeting in 2018. Around the same time, I also decided to enter another contest being held by Western NC Magazine. 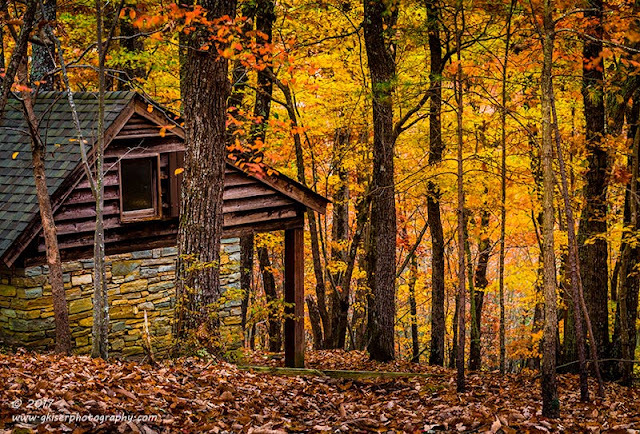 This was a reader's choice contest and there were over 600 images submitted to the magazine. I didn't know how the voting would work, or when it would start. It was purely by chance that I stumbled on the website and saw that the first phase of voting was about done. There were 100 images that the editors had selected for this first round of voting. I was overjoyed to see that two of my five entered images had made the initial, juried, cut. Unfortunately, I was unable to even vote for my own images over the previous two weeks since I didn't even know voting had opened. Since you could vote once a day, I figured that all was lost. However, at the end of that stage, those same two had made it into the final 25 images which were the contest finalists. Honestly, I count that as a huge win for me. Without me rounding up votes for my images, they both were strong enough to get pushed through by other voters. For the next two weeks though, I voted for my favorite of the two, Gnarled Centurion each day. 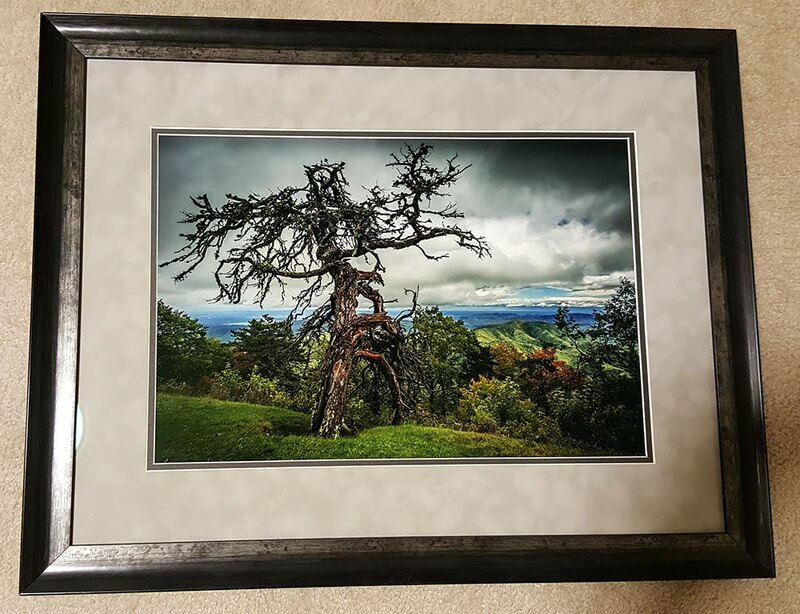 What can I say, I would love to have either of these images bring home the top honors, but Toni adores this tree, and I wanted the win for her. As of the time of this entry, the winners have not been announced. I sit here patiently waiting for the issue to hit the newsstands in January. Having just seen the final votes tallied, I'm a little sad to announce that neither of my photographs won the contest. I got honorable mentions on both of them though, and they were still in the final 25 images out of over 600 which is still a win in my book! Speaking of magazines, I have also submitted a full length article to the quarterly publication, Camera in the Wild (a CNPA magazine). I've been thinking about doing some writing for magazines, and I figured I might as well try with a club magazine first. I submitted my idea about "shooting for conditions" and it was approved. It will be for the Spring issue, so I don't know how it will turn out. At least I can say I tried, and hopefully I can say that I've had a photography article published in a magazine in the next few months. In addition to contests and magazine articles, I also started to look at other outlets for my photography. In a strange twist of fate, I found a very meaningful use for my photography by way of a work connection. Our Child Response Initiative representative, Eileen Martin, was doing an internship with the Kellin Foundation. As part of that she was facilitating a therapy group that involved healing through the act of photography. The premise was one that I held near and dear to my own heart, so participating was a natural step for me. Having suffered from a mild form of PTSD for years now, I have learned to self medicate through photography, and I had an opportunity to share that experience with the group. I was invited in to do a presentation around the slide show that is attached here. It went very well, and Eileen and I have already discussed the future of this program. I think it will be a great opportunity for me to help others through photography. Something that I have always done in my photography is used Facebook as a marketing tool to get my photographs out there. I've been tweaking how I do things on Facebook for years to try and optimize the tool. This past year, I have joined many different groups where I share my photographs as I capture them to gain a much greater audience as well as draw more viewers to my page, and ultimately to the website. I would say that this has been a great success as I started the year off getting a reach of around 50 viewers on any given picture. These days, it is normal to see between 3-7K views of my photographs. I also have reached over 1,000 followers on Facebook from the couple of hundred that I had at the beginning of the year. I also have an Instagram account which had an audience of about 150 at the beginning of the year. In the summer, I decided that I would put much more effort into that account and spend more time cultivating that community. I learned how the hashtags worked, and found that getting featured by the various hubs got my page a lot of exposure. I'm still learning how things are working there, but have a nice system set up where I will post a picture or two each day, and will share it with about 15-20 hubs each time. In about six months, I've increased my audience to over 500, which isn't too bad at all. Social media has been a big draw on my time, and I can say that it has been very much worth it. I have gained much exposure, and have been able to interact with potential clients on a personal level. I've also made contact with numerous photographers that I have learned a great deal from. 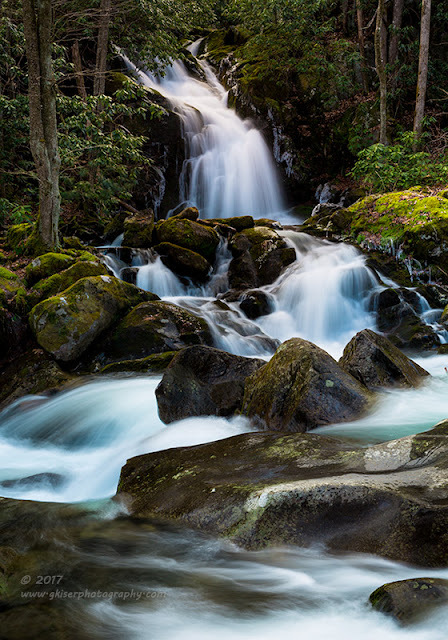 There are even ideas floating around about me conducting a workshop on waterfall photography. 2017 has been a banner year in my photography. I have grown not only in exposure, but also as a photographer. My images have matured quite a bit this year. I'm rediscovering the "fine art" quality of photography, and capturing the images that I feel fit in that genre more and more. I still have a lot to learn, but I can say this. I had a huge artistic change in the middle of 2016 that really provided the direction for 2017. I have a momentum built up from that which is still very strong and I am constantly seeing improvement that I expect to continue into the future. I want to take this opportunity to thank everyone who has shown support over the years I've been a photographer. It is that support that keeps me motivated to go out again and again to try and create that next great picture. While my photography will always be for myself first and foremost, it does mean the world to me that others are enjoying my efforts. Thank you, and I look forward to the coming year behind the camera. 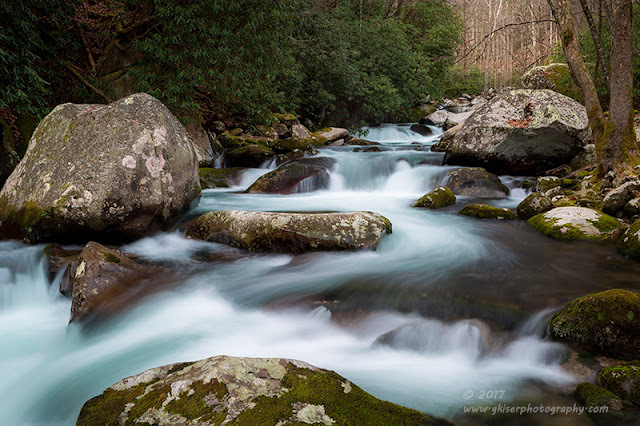 For the last two months, I have been wanting to get to Big Creek in the Great Smoky Mountain National Park to work some of the water there. You see, this is the only place I know of in this part of the country where the water has an aqua or teal color to it. I've been fascinated with it since the first time I visited the hiking trails years ago. 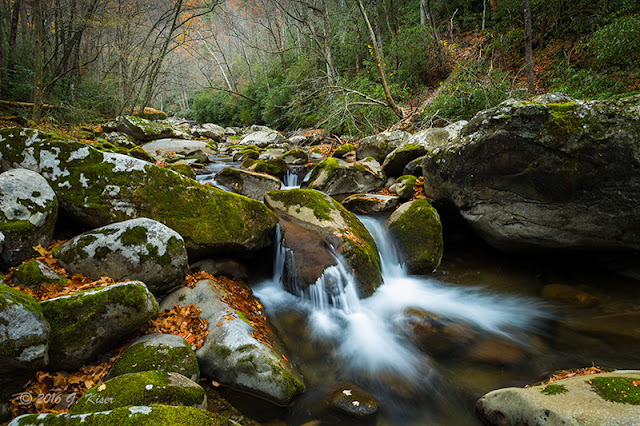 Beyond the color, I have always loved the creek itself for all the different personalities that it possesses. I've seen it in droughts, and just after flooding. Each time has been something special, and I've always come back with images that I have been really proud of. 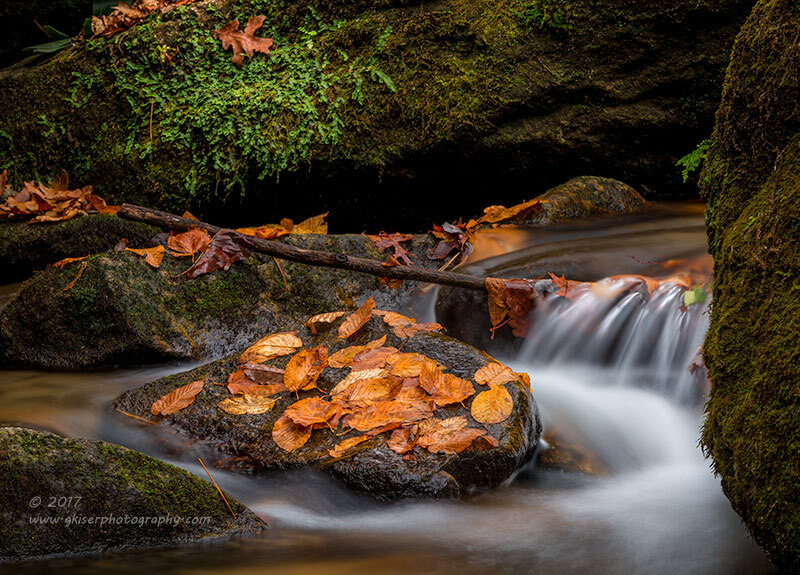 My plan was to get some Fall color matched with the cool tones of the water. The problems that I ran into ranged from lack of rain, to lack of time. 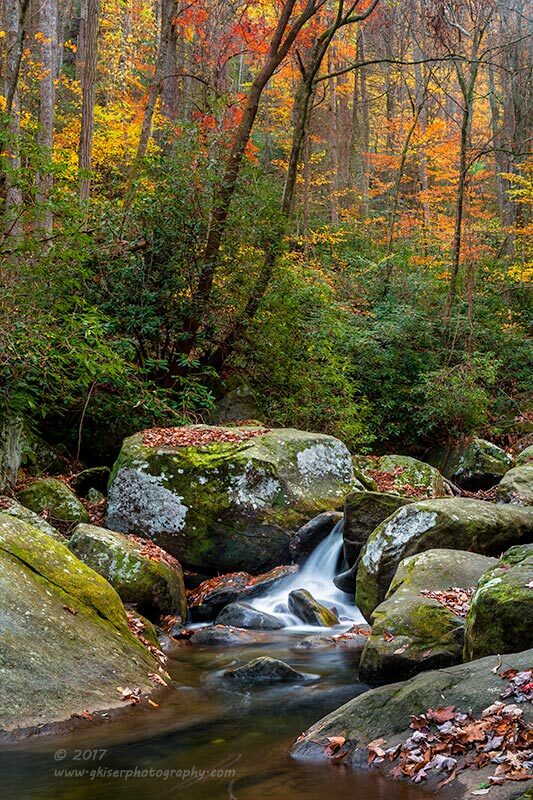 You see, Big Creek is a full 200 miles from my house. That is an investment in both time and gas. I try to schedule my trips out there when I know I will have the time to make the best use of it. With several extra days off of work, and the promise of some clouds, I figured that now was as good a time as any. My day started early, earlier than I really needed it to. I woke up at 3:30am so that I could see Anthony and his family off after they had spent the last couple of weeks here from Hawaii. They left at 4am to catch their plane, and I followed about an hour later headed the opposite direction. 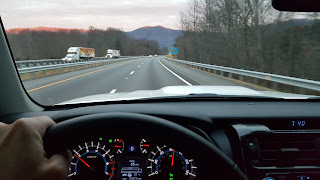 I was destined to see the Tennessee State Line before hooking back into North Carolina into Waterville. The trip was pretty boring, with just a little heavier traffic than I was expecting. The weather forecast was calling for partly cloudy skies with about 46% coverage for most of the day. From my history, that could mean anything from rain, to clear blue skies. There was no way to know what was in store for me unless I just went out there to see. When the sun started to come up, I was very pleased to see that there was a nice thick cloud cover above and the lighting was pretty much perfect. At least for the moment. I could see sections of blue sky back to the South. The hope was that the clouds would stay overhead while I was working Big Creek. When I arrived, the conditions were nearly perfect. The water levels were up, and the sun was hiding behind the clouds. It was shaping up to be a great day with the camera. There were only a couple of other cars in the parking area, so that meant that I was going to have the trails to myself for the most part. That was the icing on the cake for sure. Big Creek has a tendency to get crowded during much of the year, so I was pleased to see so few hikers around. The first order of business was to get my gear. That was a little less than automatic like it usually is. This was the first time I had used my new camera bag that Toni had gotten me for Christmas. 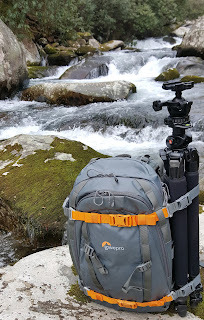 It was taking a bit to get used to, and it allowed me to actually carry my tripod on the side of it. It didn't take but a minute to mount it and get ready for the hike. Getting all of the buckles cinched was another matter entirely. I had fit it the previous night, but I had only been wearing a t-shirt. With the sub freezing temperatures, I was wearing quite a few more layers of clothing this morning. That just meant that I was going to need to adjust the straps a little bit. Before too long, I was on my way down the trail. Something that I really liked about this Whistler 350AW bag was that despite it being heavier than my previous Tamrac, it was actually quite comfortable to wear. Everything felt nice a balanced which made hiking with this bag a breeze. Something that I try to avoid here is shooting the same shots over and over again. If I think I can improve on them, then I am happy to try, but after a couple of very successful Treks here recently, I didn't think I could improve on most of the compositions. That meant that I spent my time looking for new and exciting compositions. This can be difficult since it requires going to different vantage points for familiar scenes and locating completely new subject matter in many cases. 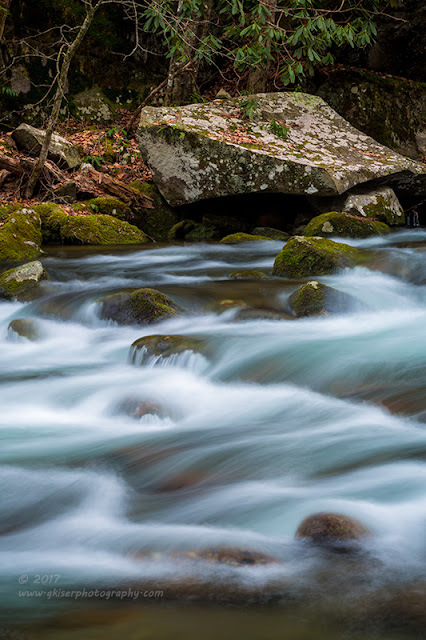 Since the trees were mostly bare, I set out looking for intimate shots of elements of the creek. That way, I could avoid the bare trees that weren't adding much to the compositions in most cases. Of course, when I could fit the trees in, I did just that. 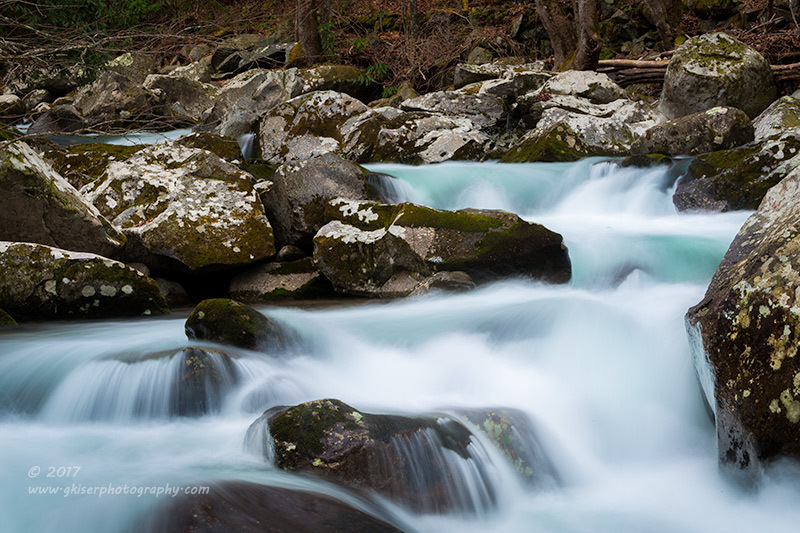 My main focus was to capture the aqua color in the water which is what I just love about this creek. 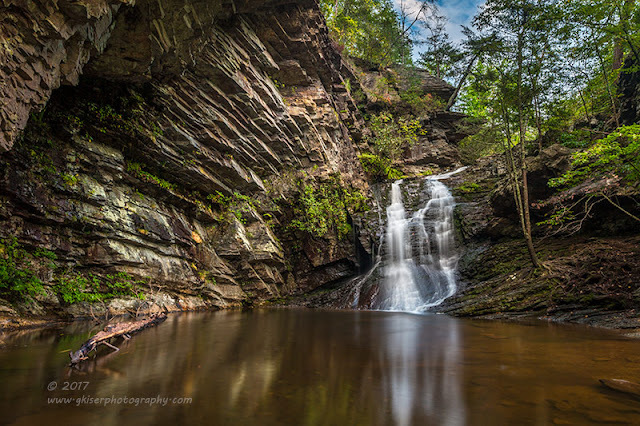 My secondary goal was to make it to Mouse Creek Falls. That particular attraction is located about two miles down the trails from the parking area. In the past, I've missed out on getting that far down because it started to rain in one case, and the sun came out in another. The last time that I had photographed it was during the drought. It turned out pretty good, but I wanted to get it with more water flow. 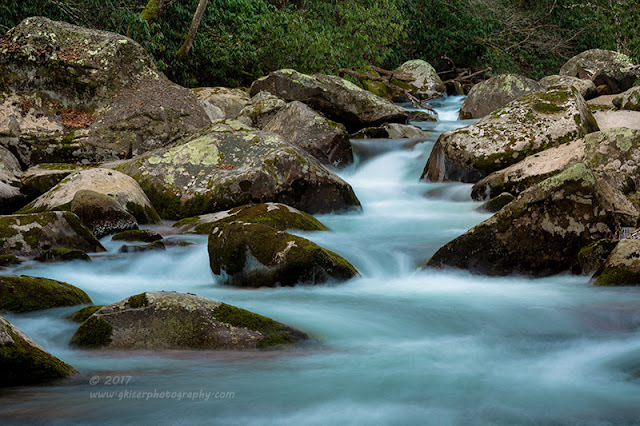 The trick to photographing Big Creek is to use a polarizer. For the most part, I used my Singh Ray Color Combo Polarizer which helped to increase the saturation in the water. Depending on what I was shooting, I was using either my 24-70mm or my 70-200mm lens. My goal was to hit between 1-3.2 seconds worth of exposure. That was enough to get the water to blur like I like. I shot some abstracts, and shot some full on compositions. It was a day of trying new and different things. I wasn't sure what I was going to have when I got home, but I was having a lot of fun moving around and trying different vantage points. Something that I found very useful with my new camera bag was the fact that the tripod would secure easily to the side. I thought that I would just use that for the main hike in, and out. The reality was, I was using it between subjects to keep my hands empty. This allowed me to be much more maneuverable than I had been in the past. No longer was I stumbling along holding a bulky tripod in one hand. I was able to use both of my hands to steady myself as I rock hopped, and went down embankments. It was as if I wasn't even carrying my camera equipment, and that was really nice! I can see this really helping me get to some locations that I have not been able to get to previously. At least it will make getting to them much easier. While there are two named waterfalls along Big Creek, I've found that the cascades are in many cases more interesting to photograph. 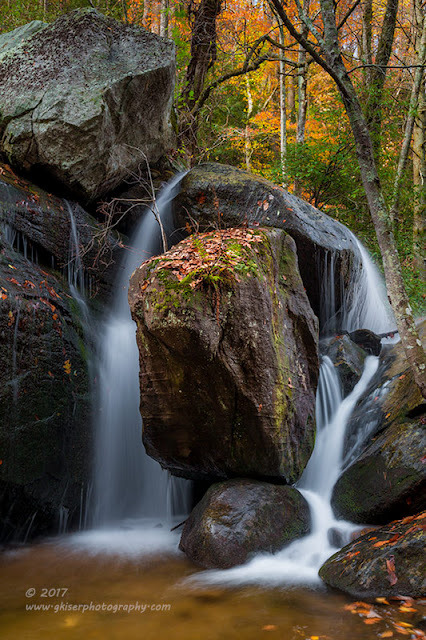 There are so many boulder and rocks strewn about the creek bed that there is an abundance of cascades to play with. 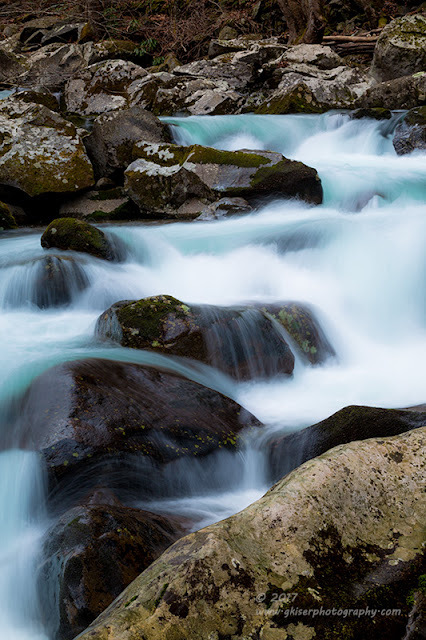 I found myself looking for patterns in the cascades that lead to features on the opposing shore. I found quite a few, but most had no organization to the pattern. The one that I have included above, had a nice "S-Curve to the cascades and lead to the rock. Had the rock not been an interesting shape, this probably would not have been as successful of an image. 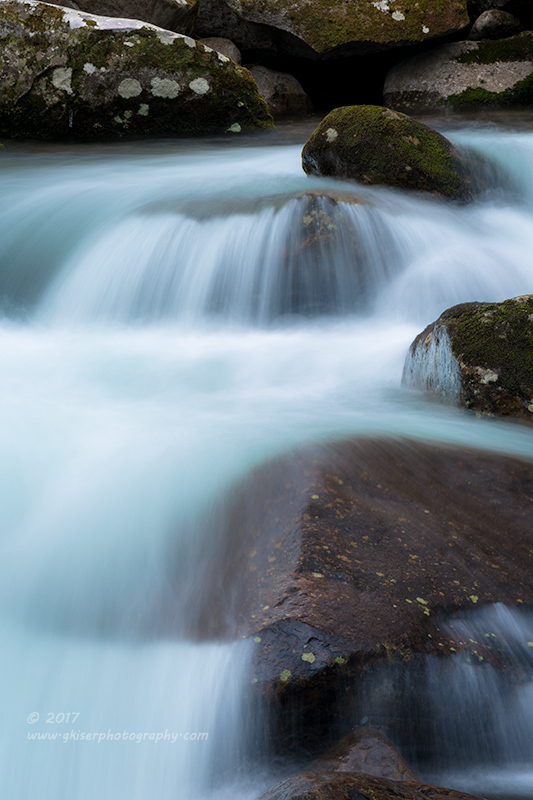 As it sits, my eyes work completely through the frame following the cascades and then bouncing on the rock to retrace my steps. It is a bit of a funky image, but one that I am liking a lot. When I got to Midnight Hole, my first inclination was to skip it. I had shot a really great image there over the Summer and didn't think that I could top that. However, there was a section of rapids just before Midnight Hole that I was working that kind of changed my mind. You see, I was making my way along the shoreline getting closer and closer to the waterfall. It was a view that I had not seen before. There were a lot of rocks in the water, and even a couple of frozen twigs sticking out of the water. 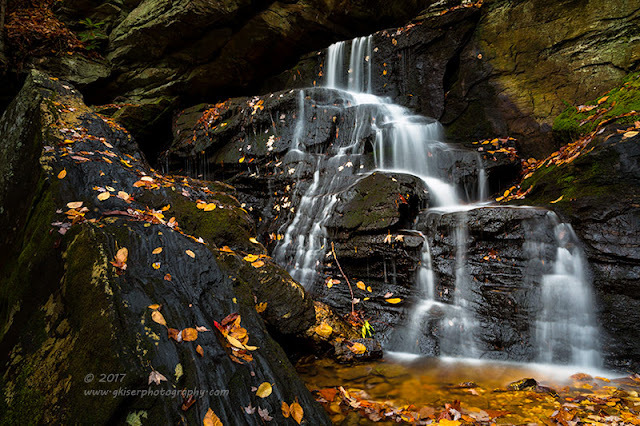 My foreground for this waterfall has always been the pool, or the root system of a tree that was close to the pool. What I was seeing here was something completely different. I was liking it...a lot. I decided to fit my long lens so that I could compress the elements and shrink the distance between the falls and the foreground. It took some work to get the composition right, but I finally made it happen and grabbed a few frames. I wasn't sure if I liked it or not though. It wasn't until I got home and processed the images that I found that the composition actually worked very well for the waterfall. It also gave some really good clues as to the time of year. I had a splash of green above the falls, but the ice on the twigs tells a completely different story. The more I look at this one, the more I like it! One of the nice things I got to do with Big Creek is to play around with vertical and horizontal images of the same scenes. The two compositions directly above are of the same section, just with a different composition. They both have a completely different feel to the image. They say different things, but you can see the benefits of trying different orientations with the same subject. You can even compare the last one to Abstract in Teal and see what a difference a slightly tighter composition will make. Again, there are two similar images, but each tells a different story, and has a different focal point. different lenses into the field each time I go. As you can see, I really liked this section of the creek. The color was very vibrant, and I spent a good deal of time here playing around. I started out with my long lens, but decided to switch over to the 24-70mm, standard lens. This allowed me the ability to open the shot up and get a completely different composition with the large boulder in the foreground. Having easy access to my equipment is very important to me in the field. 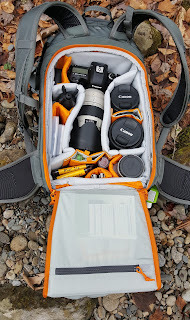 One of the major complaints that I have had with my previous Tamrac bag was that in order to access my equipment, I had to place the back of the bag on the ground. That doesn't seem like a big deal until you have to set it on the wet ground. Then when you put the bag back on your back...you have a wet back. This Whistler bag has a rear opening compartment which means that the part of the bag that ends up on your back stays nice and dry...and clean. It takes all of the hassle out of changing out your equipment. I would have liked a bit more room to grow, but I do have enough room for what I currently carry, and that is good enough for me. As I was getting closer to Mouse Creek Falls, I was seeing that the sun was starting to poke through the clouds more and more. This was going to be problematic as it was nearing noon. that would put the sun directly overhead and the highlights in the water would make for exposure problems. I had a choice to make. 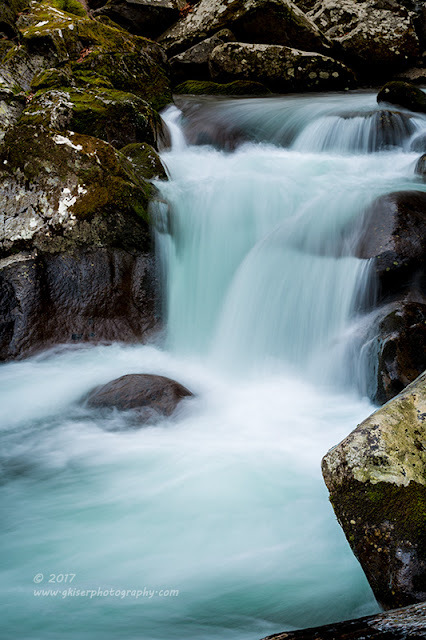 I could continue on with working the different rapids and cascades, or I could hurry on to the main falls and hope that it was looking good. Since I had missed out on chances in the recent past, I opted to plow on and see if it was worth photographing before I worked any other scenes. I bypassed a couple of really good areas to shoot from, but I was comforted knowing that I had gotten good images from those areas in the past. When I arrived at Mouse Creek, I was greeted by a water flow that I had never witnessed here before. It was incredible to say the least. I moved my way down the embankment, and built the camera with my standard 24-70mm lens because I wanted to capture some foreground interest to the falls. 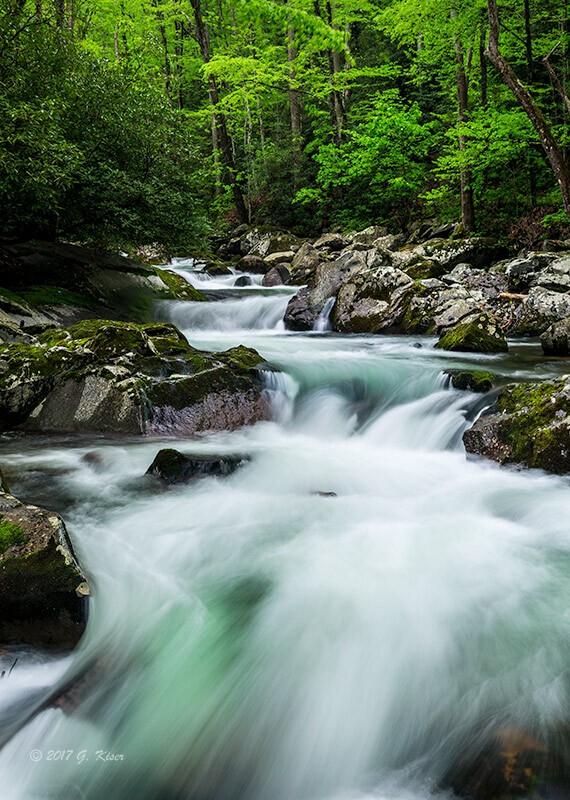 I started with the self explanatory portrait shot and included some of the actual creek that was moving from right to left across the scene. 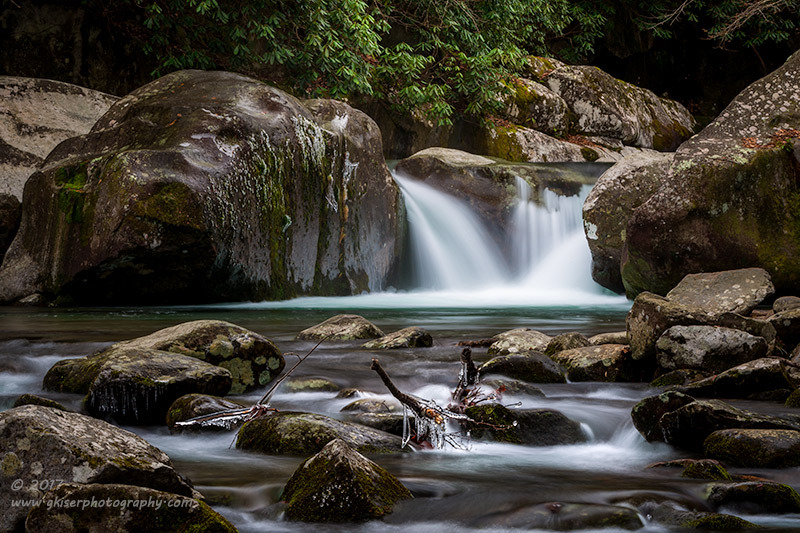 The rocks, shallow water, and cascades made for a very interesting foreground. The colors in the water were incredible too. I was very happy that I had skipped other compositions in order to get this subject. I had never seen it quite this good before, and I was excited to work it for a while. I tried a few different positions, and several different compositions. I had thought I had a winner with the portrait shot, but I started to play around with a horizontal version as well, and found that I liked it even better. The horizontal version brought the falls into an intimate composition that really suited it. The viewer can see the ice which has formed along the edges of the falls. This definitely gives it a sense of season, and adds a bit of chill to the image. The power of the water is unmistakable and really helps to complete a dramatic composition. About the time that I was shooting this one, the clouds were all moving out of the sky. It seemed like in a matter of seconds the sky went from partly cloudy, to bright blue. There were no more clouds in the sky, and the sun was now shining brightly. My day was done, but it was after noon, and I was needing to get home anyway. 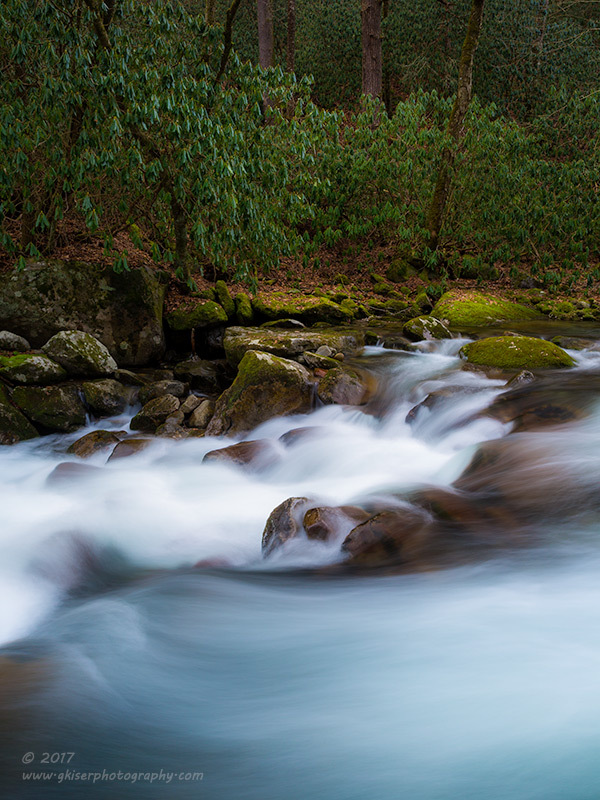 In about 4.5 hours, I had shot 131 frames of the teal water of Big Creek. 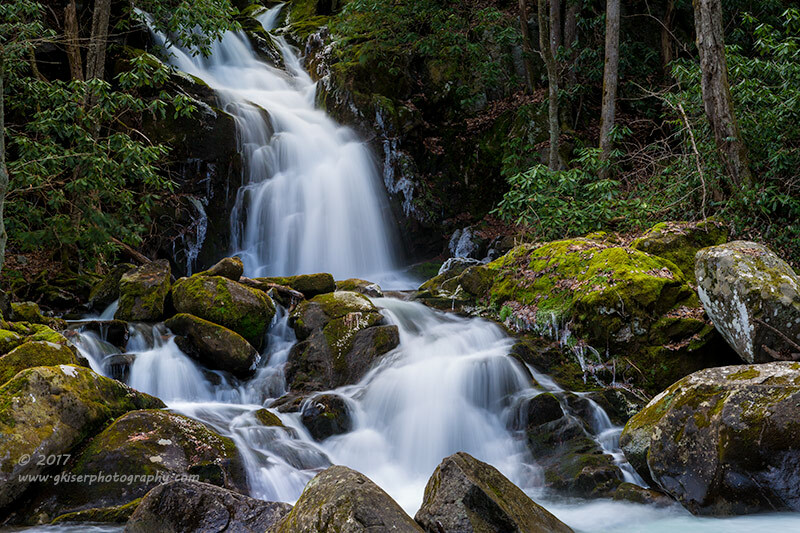 I had also gotten two great images of Mouse Creek Falls that actually changed my opinion of how good a waterfall it actually was. 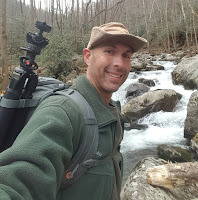 I'll say it was a very good day behind the camera, and it was great to get back to Big Creek once again. It has been a great year for my photography, and after 12 months of shooting, I have captured a lot of different scenes. Looking back on the year, it is hard to pick my favorites, because each was shot with a different purpose in mind. Looking back through the galleries, I think that for the most part, I am drawn to the more colorful images from the year, which have mostly happened here in the last few months. That could also be a product of them still being new to my eyes. I'm sure that not everyone will agree with this list, and to be honest, I don't necessarily agree with all of it either. However, after a lot of thought, I think that these are my best images of the year...in no particular order. You will also find the link to the blog entry associated with the picture below the image title. Winter is one of those weird times of year for photographers. Personally, I really enjoy it, and have always been able to get out and get some really good images this time of year. However, it takes a little bit of time for me to calibrate to the season after so many months of having color on the landscape. I typically shift from doing landscapes to capturing more rural scenes which bring their own colors and textures. With Fall winding down, I am still in the frame of mind to work landscapes though. That was the original plan for the day when I was looking at the weather forecast. I was looking forward to increasing clouds through the day, and I figured that I could head back to Stone Mountain and go up to the higher elevations to work some scenes there. I also happened to check out the sunrise forecast and found that pretty much all of NC was going to see a potentially colorful sunrise. Since Stone Mountain would be closed until after sunrise, I wasn't going to be able to do anything there, but I wanted to find a good place to take advantage of the colors of morning. My first thought was Salem Lake, but having just done a really spectacular image there, I opted not to revisit that same location just yet. My second idea was an old feed mill in Yadkin County which has changed a good bit over the last year with both booms coming down. I have tried to photograph that building under the morning sky several times, but haven't quite gotten it right. I figured it was on the way to Stone Mountain, so this would be the morning I would give it a try. I woke up around 5am and was on the road a little before 6am. That gave me plenty of time to get to the mill and find my composition before first light. When I got there, the sky was already starting to show some colors and I was getting really excited. There was a problem though...actually two of them. First of all, it appeared as though they had plowed the field that the building was in. That would make it hard to get into position, and I really didn't care for that as a foreground. The second problem I was seeing was there was a tractor trailer pulled down to the cul de sac with the driver apparently asleep in the cab. Anywhere I parked would put me in his way, and had a great potential of getting my truck hit. Since the scene wasn't as I was hoping for, and the tractor trailer was causing problems, I opted to abandon my first stop on this photo tour. It was still too early to continue on to Stone Mountain, and the sky was looking incredible. I decided to drive off blind and try to find something interesting to put under the sky. It seeks I'm always chasing something to give context to the sky when I am out with the camera. I was well into rural Yadkin County, so I knew that there would be trees and barns that might work for me. I drove around in the dark, paying attention to where the light was in relation to the ground features. The more I drove, the more I started to think that this was going to be a lost cause. I was happy that I was witnessing one of the prettier sunrises I've seen in some time at least. At that point where I was about to throw in the towel, I saw a very interesting tree on the correct side of the road. As I got closer, I could seen an old farmhouse sitting between two trees. It was position absolutely perfect to give attention to the sunrise. I quickly pulled off the road and grabbed my gear. I evaluated the scene quickly and determined that the proper lens would be my 24-70mm with no filters attached. I got right up on the fence line (as close as I could get to the house) and started to compose my images. I started off including all of the elements I had seen with the two trees and the house. The exposure was pretty straightforward and I did not need any grad filters as the sky was the predominant feature. Once I had a few frames that I liked from that composition, I moved over to the more interesting of the two trees and composed one just of the sky, anchored by the single tree. As I was reviewing the images in the LCD, I was pretty sure that I was going to like this composition much better than the one that I had shot previously. As it turns out though, I like them both equally as well. The sky was phenomenal to say the least. As the sky brightened, the colors faded away, and I found no reason to stay at this location. I had seen an old truck about a mile back on the road and figured that I would try to shoot that as the sun got high enough to light it up. I packed the camera up, and went a little further down the road to see what I could see. I found a lot of interesting subjects, but none of them were striking me as picture worthy this morning. After a few miles, I turned around and went back to the truck I had seen in the dark. You know the problem with scouting subjects in the dark? You can't see all that is around them. That was a fatal flaw with this truck. There were houses much too close to the truck, and no appropriate backdrop to use. I looked it over briefly, but found nothing that I wanted to work with at this particular time. But my mind was pretty much set at this point. I was wanting to work rural scenes rather than landscapes. I was getting my Winter groove back kind of early this year. I continued to drive around looking to see what I could find. The sky was interesting in some directions, and less so in others. The lighting was pretty uniform, so I was able to shoot in any direction, but to include the sky would be a little more difficult. 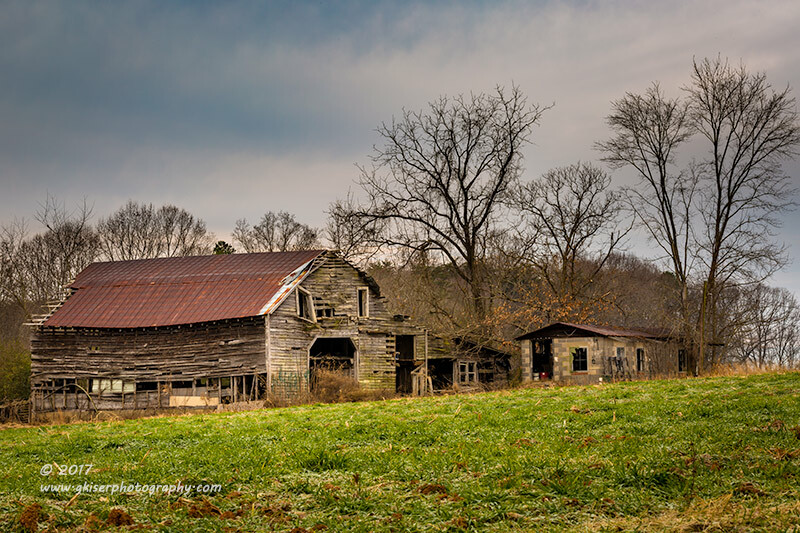 I came across a group of old barns that caught my eye. The lighting was fine, but the clouds didn't have a whole lot of definition to them. They had a little bit, but I wasn't sure if I could successfully bring it out in the editing process. It was a nice enough scene to give it a try at least. I pulled over, and pulled out the camera. I staring at a big sign that said "No Trespassing" so, I wasn't going to be able to get close to the barns unfortunately. I grabbed my 70-200mm lens and left the front element bare with no additional filters. I set up right on the property line still on the easement. I found that 125mm would capture the group of barns nicely, along with the trees, and some sky. I played around with my exposure a little bit in order to eek out as much detail in the sky as I possibly could. There was not a lot of exposure latitude to deal with, so I knew that I would be adding some contrast in post. Since I didn't have many composition options from my position, I didn't stay here long at all. I wasn't sure how this would turn out, but I was at least getting in the frame of mind to work rural settings again. 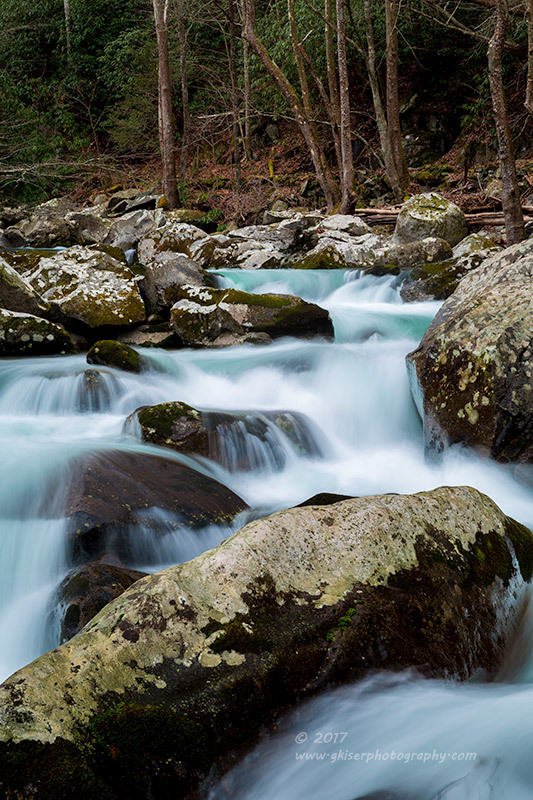 I was fine doing this instead of going to Stone Mountain to shoot landscapes. The sky was iffy as to how it was wanting to behave, and I could tell that there was very little color to be had on the landscape. I continued driving around for another 30-45 minutes before deciding that I might as well go and do a little hiking and try for some landscapes. My rural adventure was drying up. I went on to Stone Mountain just a couple hours later than I had planned on. The park was nearly empty which was great after a full season of elbow to elbow hikers. The sky was looking decent, so I decided that I would go high and shoot some landscapes from the summit. I started out the hike, and went on the loop trail which should have taken me right where I wanted to go. Unfortunately though, the trail was still closed due to damage. My only other option was to head out to Wolf Rock which I have done far too often this year. I ended up hiking back to the truck deciding to scrub hiking on the agenda. In fact, I might as well go home at this point huh? 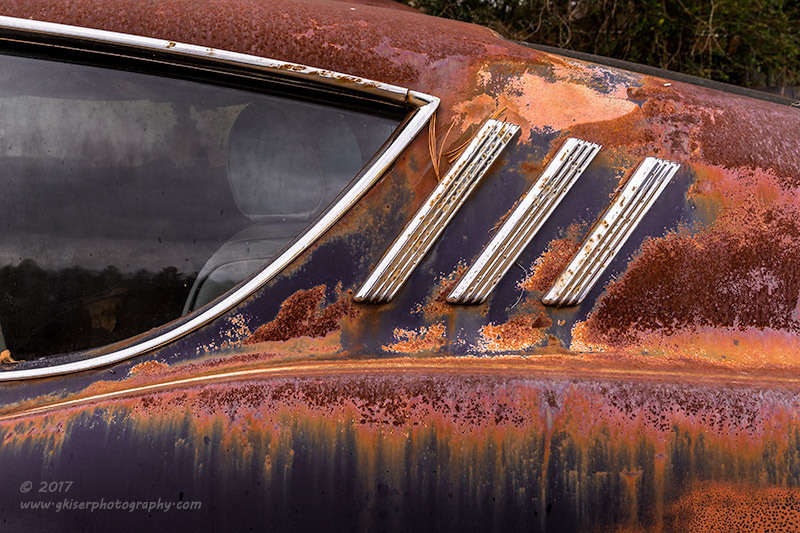 Well, the owner was home and had absolutely no problem with me working around his property photographing his cars. I was excited about this! I pulled the truck out of the way along the road and grabbed my gear. I opted for my 24-70mm lens once again, and added my Singh Ray Color Combo Polarizer to help punch up the colors a bit. The first car I worked was a 40's Ford Coupe that was nearly complete. It was sitting next to an embankment that made for a great backdrop. I just had to be a little careful with the clutter that was around the car. Before I moved on from this car, I decided to give the front emblem a little bit of attention. This was different than most of the bling that I have been photographing recently. 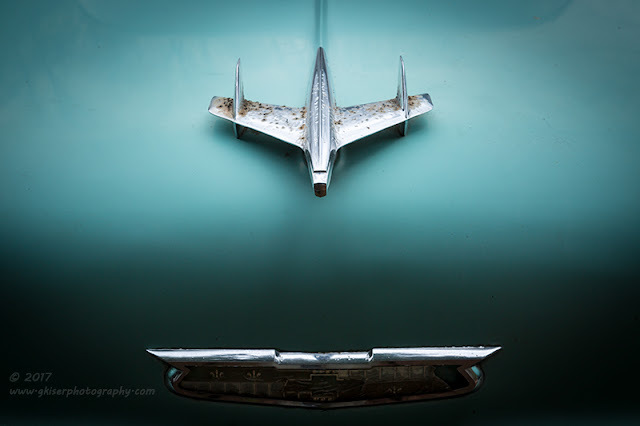 The way it fit on the grill, and the lines created by the grill, hood, and fenders really worked together for an interesting automotive abstract shot. That was how I framed the image in the camera. I put the Ford logo in the most dominant position and let the rest of the line work around that part of the composition. 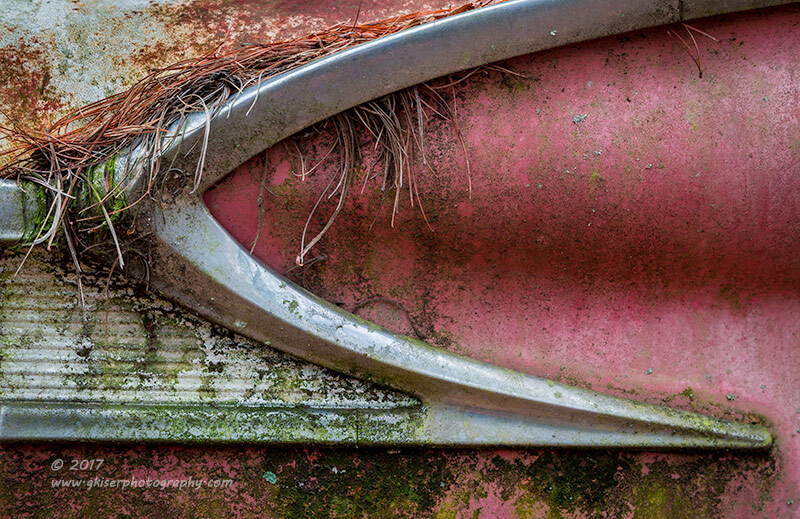 It made for a very interesting picture, and the textures of the moss and rust really added to the artistic quality of the image. Speaking of emblems, there was an old Ford pickup nearby that wasn't all that great for photography, but it did have a nice color paint on it. The tailgate had a wonderful stamped Ford logo on it that was painted white. It was a simple composition, but the fact that there was a huge section of rust at the bottom of the "F", I had no choice but to capture the image. It wasn't quite the same as a chrome emblem, but the white script really stood out against the light blue paint. 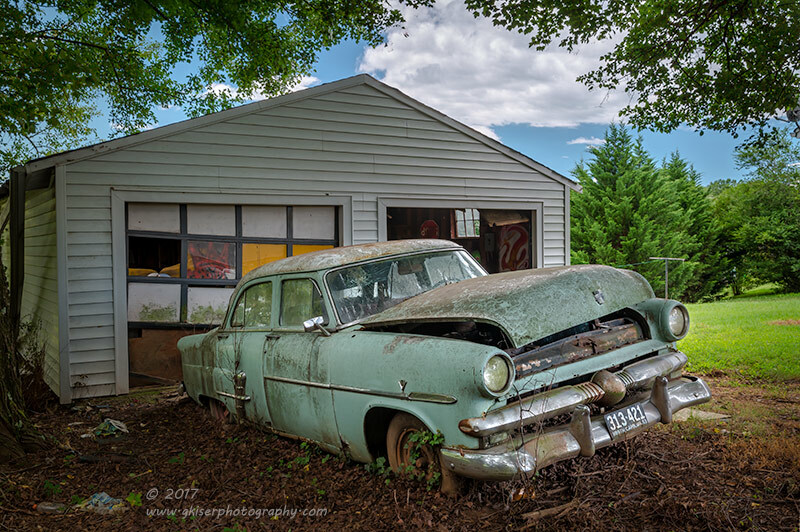 I should have counted how many cars this man had on his property. Everywhere I looked, there were cars, trucks, and jeeps. Most of them were just the shells and not much else. Some still had enough character to photograph though. The trick was isolating them from each other. Sometimes that couldn't happen, so I had to include several of them at once. The fact that the backdrop was a nice woodline was a huge bonus. I would love to know the stories behind these vehicles. That would have been the icing on the cake! There were more times than not where I wasn't able to capture the whole car, whether because of clutter, or simply because there wasn't enough of the car to capture. When I ran into those situations, I would go in for the intimate study on some of the lines of the cars. Most of the chrome had been stripped off of the cars, but occasionally I got lucky and found some bling to work with. There is just something about the style and the lines of the automotive decorations from this era. 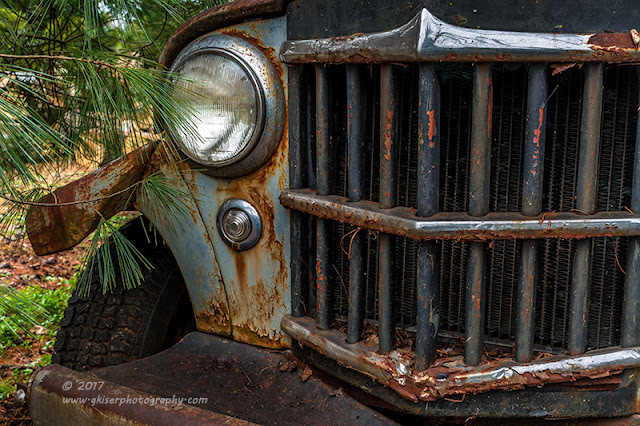 Add to that the patina, and pine needles, and you have a very interesting picture! There were times that most of the vehicle was gone, and there were no embellishments left on the remaining shells. Occasionally, I would luck out and there would be some parts of the dash remaining. I found one that had an intact instrument cluster and a missing door. The one remaining window was right above the cluster, and there was a nice spider web on the dash. That made for a fun little composition to change things up a little bit. It struck me as funny that the odometer could be seen clear as could be, while the speedometer was almost unreadable. I doubt that either works any more though. There was a great Ford fastback from the mid 60's sitting there. It didn't have a front clip, but it did have the chrome gills on the oversized "C-pillar" which really grabbed my attention. The patina around them was awesome and the swooping lines of the quarter window really fit with the flow. The lines of the fastback, as well as the body line on the quarter really added a lot of visual interest as well. I spent some time working on this element as I included it in several compositions. 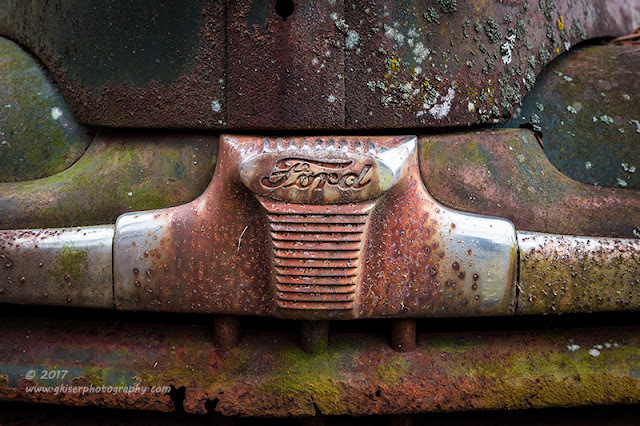 When it came to rust, I think that this Ford had the other beat. There was just enough paint left to really make the rust pop off of the metal. The chrome really stood out as well. 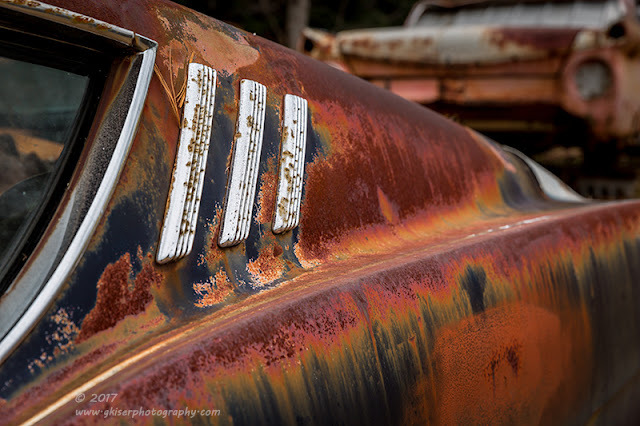 Compositionally, this car made for some fine photographs with the lines. 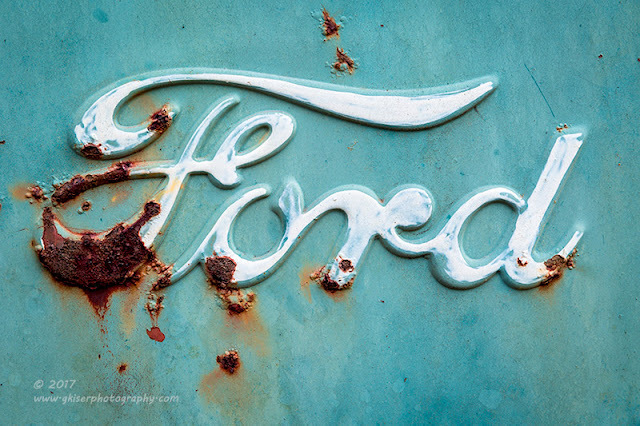 Pure art from Ford back in the day. I really wish that the car had been a little more complete though. Speaking of complete cars, there was a Four door Bel Air that was in really good shape and was mostly complete. 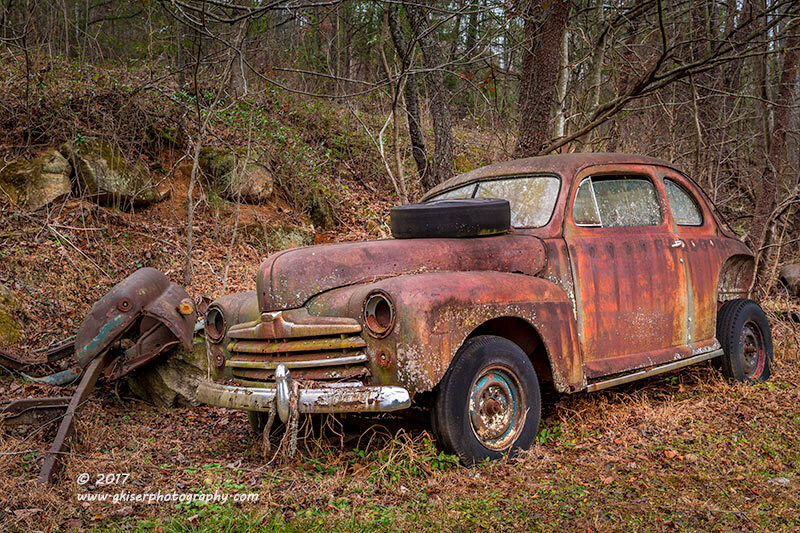 The paint was even in pretty good shape, although you could tell that it had been parked for a few years now. I tried several different compositions with it, but the paint was just too good, and the front was in the shadows. I was about to hang it up for this car when I got the idea to work on the hood ornament. While I was putting the composition together, I noticed something really cool. The shadows on the hood made for a very distinct division of tones, and the lower hood emblem was still picking up the light on the top edge. This was looking rather interesting to say the least. It is no surprise that I really like working with emblems on old cars. Part of that is the emblems are usually set off by a wonderful patina. Not in this case though. Like I said, the paint was actually in pretty good shape, and there was no patina to speak of on the hood. I photographed this one with the full intention of really massaging it in Lightroom to take full advantage of the contrast that the sun was already providing. I wanted to keep the lower emblem in the shadows except for the top edge. The focal point was going to be the plane, and I wanted to gorgeous paint to melt around these elements. This wasn't going to be a grungy rendition showing the rust, but a pure abstract that makes you think of something else entirely. The more I played with this image, the more I liked it. The cool tones were very relaxing to me. The simple composition was striking, and the editing that I did seemed to really accentuate the elements that I was wanting it to. I think that this is probably my favorite image of the day, and I've got at least one other vote in that direction from my daughter Lexi. One thing that I haven't photographed much has been old Jeeps. There were several on this property, and they were in varying degrees of condition. One of them on the front of the house was pretty complete, but was surrounded by a lot of clutter. The only way to really get this one was to shoot an isolation. I started out just with the grill, and then added the right headlight. However, I decided that I wanted to try to go at an angle to include the fronds of a tree next to fender for a bit of context. The predominant grill was still the focal point, but the headlight brings your attention to the tree so you immediately get the feel that this is an offroad vehicle. It is a little different than my normal compositions, but I'm enjoying thinking outside of the box these days. Before packing it up, I went around the house one last time and found a semi enclosed garage that housed the project vehicle. Of course the lines of this car caught my eye as I've always been a fan of the 40's coupe designs. An odd element that I liked was the skylights above. They gave not only some visual interest, but helped provide a leading line into the photograph. I would have loved it if the trash barrel was moved, but ultimately, everything here tells a story. 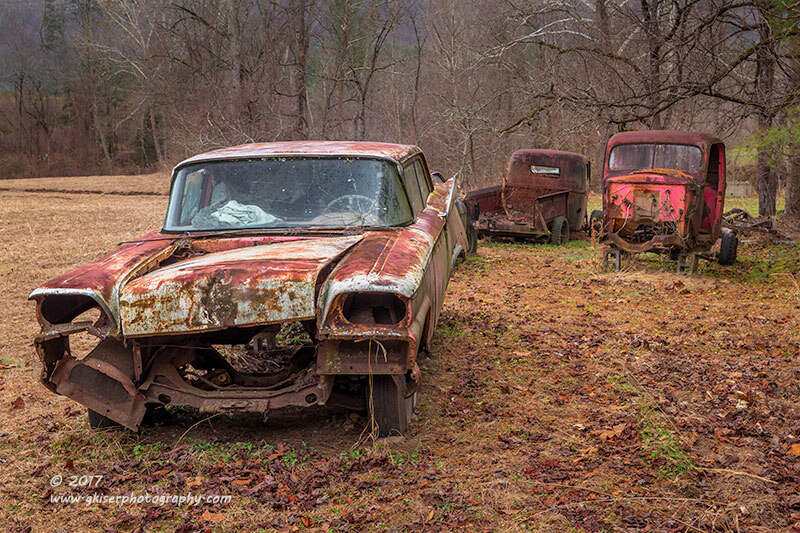 As my last set here on this property, I was going to tell the story of why there were so many cars on the property. It was a complex story, and scene to photograph. I figured that in order to really put it all together, I could shoot this as either a portrait or a landscape. When I got home, I liked them both equally as well, for different reasons. I even liked the "Private Property" sign (mainly cause I had permission to be there) on the wall. Everything here was telling a story, and that is my job as the photographer...to tell the story. After a year, I had finally gotten the ability to return to this location and shoot so many of the cars. It wasn't the landscapes that I had gone out looking for, but for that matter, my sunrise wasn't the scene that I had planned. In fact, nothing about today had gone to plan, but in the end, the result was so much better than what I expected. This will be a fun Winter I believe! At the end of the day, I had shot 90 images. I decided that 15 of them were worth keeping, and I had another handful that I liked, but they weren't quite special enough to process. It was a spectacular day, even though I had my doubts at every step.